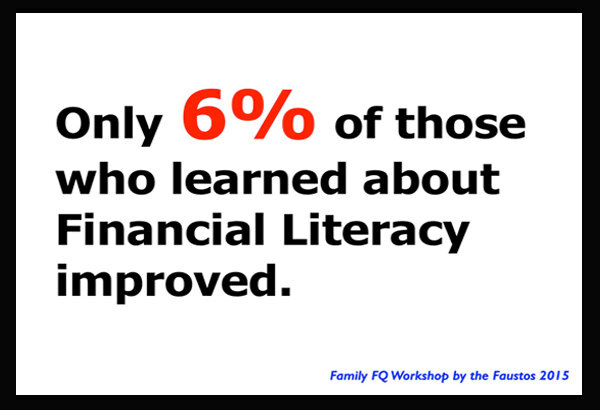 Only 6% of those who learned about Financial Literacy improved financial behavior! Very alarming! Even depressing for practitioners in the field of Personal Finance. Didn’t we always say that Financial Literacy is the key to Financial Freedom? That was the slide that Marvin flashed on May 9 during our Family FQ Workshop by the Faustos before 500 participants, then again on May 16 during the CFA Philippine Retail Investors Conference before 1,500 participants. Dan was referring to the 2014 meta-analysis (Financial Literacy, Financial Education and Downstream Financial Behaviors) that compiled more than 200 studies of financial education programs. (See link to the study below) He said that the conclusion was that financial education has a negligible impact on subsequent financial decisions and behavior. Most people who take a financial literacy class forget what they learned within 20 months. Marvin’s slide garnered some unhappy reactions because it’s quite disheartening to accept this, especially to those who volunteer their time and effort, who have devoted their life, and even those whose source of income is financial literacy. Personally, I was not surprised at all and that’s why when Enrique showed us this information, we agreed that Marvin should include it in his presentation. We hate to “burst everyone’s bubble” but the truth is financial education is not enough! Don’t we all know that we have to eat well and exercise regularly in order to be healthy? But do we? We all know that the laws of money are simple but do we observe them? It’s not in our nature to always save and invest, or eat right and exercise. We are exposed to temptations. We are not always rational in our decision-making. We tried to address the above challenges in our workshop. We refused to just take that measly 6% sitting down. We shared what we know, what worked, what didn’t. First of all, financial literacy is still important. We don’t negate this. In my experience of over two decades of parenting, understanding the logic and knowing the compelling reasons behind any rule we set at home while the children were growing up, made it easier for us to make sure that they will abide by our rules even when no one was looking. Of course, it took more effort explaining, allowing the boys to argue, but in the end, it saved us a lot of time and tears because they knew what those rules were for. The same is true in financial matters. Start them young. In our case, we started their financial literacy journey when they were born as we opened their individual bank accounts, no commingling of funds from the very start. This also made it easier for us to teach them about saving and investing because we had their very own growing funds to show when they started asking. The bonus is that challenge no. 1 above (not in our nature to do so) is somewhat mitigated. Since we introduced the formula Allowance less Savings = What You Can Spend (our version of Pay yourself first as early as Grade 1), they somehow find it natural to always set aside at least 20% of any cash they receive. Simplify and make it fun! I’ve written about this and it continues to be my battle cry: Finance should not be boring and/or intimidating. Finance is Fun! This is how we carried out the workshop and the feedback was overwhelming. A lot of participants said that listening to our young sons talk about saving and investing in simple terms (small account, big account, etc.) and adding the things that they love like dancing was refreshing and encouraging because they realize that if these kids can do it, so should everyone else. Don’t count on yourself to always make rational decisions all the time, so once you’ve made that decision, automate it! This is a very important “life hack” when it comes to saving and investing. Decide once, then let it run its course. This is why I love the power of automatic saving and investing, taken out of the payroll account; it somehow makes it almost at par with taxes when it comes to priority of payment. Believe me, when it’s not like this, it’s hard to do it “religiously.” Don’t we always say, “The mind is willing but the body is weak?” You will always have reasons like extra expenses, no time to go to the bank, etc. Involve the family. Any value system is best observed when done as a family. Moreover, since we believe that any talk on money should be aligned with our core values and who better to do this with than your family? It wasn’t easy coming up with a financial literacy workshop that would work for a very wide age bracket – 4 to 64 maybe? But our family thought it best to bring all the members together, to make it a bonding activity. Isn’t it always better to discuss the lessons, highlights and insights of a movie or book with someone who has also watched or read it? It is never the same as when someone is re-telling you what happened. And so we faced the challenge of appealing to a wide age bracket. We wanted the parents to learn from the workshop that giving a small amount in allowance and cutting their financial umbilical cord once they graduate will work well for their kids in the long run and we wanted the kids to not hate their parents for doing so. We wanted both parents and kids to know that building self-confidence is the best antidote to peer pressure of always having the latest gadgets. Go beyond your family. Exercise Libertarian Paternalism. Because of the fact that human beings don’t always act according to their best interest, there is a need for those in power to do some nudging. We have to make use of the power of choice architecture in order to help improve the lives of the people within our circle of influence. I was happy to have employers and organizations like Divina Law, FMAP, GSN+i Design Studio, FAME and HSBC buy bulk tickets so their employees/members could attend the workshop. Fortunately, you don’t have to be a taipan or government official (but I do hope they do) to use choice architecture. In our own way, I incorporate in our household helpers compensation a “nudged saving and investing feature” such that a portion of their salary automatically goes to their Emergency Fund and Retirement Fund. I long for the day when all employers would have this default feature in their compensation once they sign up their employees. I also made a “nudged investment feature” in a long-term personal loan I extended to a loved one. I requested for an additional P1,000 in the monthly amortization and this amount does not go to me but to an Easy Investment Plan I opened for her, which is regularly invested in Equity UITF. I’m happy to check that it has yielded quite a sum since three years ago. This is what we call Libertarian Paternalism – nudging people to the right direction. I’m sure you can find a way to apply this in your own circle of influence. And so, to all the workshop and conference participants and all those disheartened by the negligible 6% improvement, be happy to know this and take charge. Don’t be the frog in Marvin’s tale that just decided to take a leap, take that action and automate it, before your irrational moments take over. Let this also be a call to everyone to exercise Libertarian Paternalism in our respective circles of influence. I read somewhere that the head of South Korea gave all his cabinet members a copy of Nudge written by Richard Thaler and Cass Sunstein, a book on Behavioral Economics that discusses ways of incorporating choice architecture in different ways. I hope we start incorporating this in our employment contracts, loans, bonuses, profit and other compensation schemes, even in the way we arrange food in canteens, etc. At a glance, it might seem like infringing on free will, but for options where the right choice is obvious, then maybe we even owe it to the people in our circle of influence to nudge them to make the right decision. Rose Fres Fausto is the author of bestselling books Raising Pinoy Boys and The Retelling of The Richest Man in Babylon. Her new book is the Filipino version of the latter entitled Ang Muling Pagsasalaysay ng Ang Pinakamayamang Tao sa Babilonya. Click this link to read samples of the books. Books of FQ Mom Rose Fres Fausto. Photo Attribution: The slide that stirred some emotions was presented by Marvin during the Family FQ Workshop and the CFA Philippine Retail Investors Conference.